Peggy Dillon is at the helm of Twins Kitchen and spent many years in marketing and communications for various agriculture groups including a soil company. Her daughter Natalie Henry helps run the business and prepare the preserves. Natalie's career spans both the front and back of the house in the restaurant business, as well as being a chocolatier. She currently is a manger at the popular Betty Burgers. Natalie's husband Peter Henry is the well renowned chef at The Cremer House in Felton. The Twins Kitchen crew understands that we live in a produce paradise and they are happy and proud to support local farmers. Their products start with great ingredients, this is why they taste so good. They enjoy creating flavors that are exciting and unique. Twins Kitchen encourages people to use their jams and mustards to create their own great, easy dishes, and to share them with their families and friends. In the Twins Kitchen family food is love, when they see people smile when they taste their product, it makes their hearts smile too. 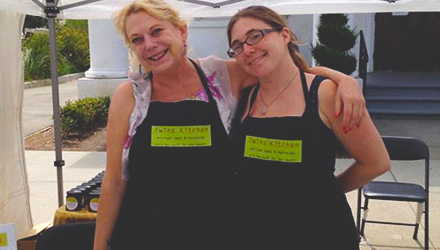 Twins Kitchen began five years ago in Santa Cruz when a mom (Peggy) and one of her identical twin daughters (Natalie) learned about a new cottage food law. It was the perfect opportunity for the long-time cook and culinary school grad to spread the love. The business name honors both daughters and plays on their philosophy of creating amazing combinations, or pairs, of flavors in each jar. Farms and Route One. They use organic fruit when possible and source from local, family farms. The mustards taste complex but are simple creations of ingredients including whole mustard seed, vinegar, and spices.